A Wilson brown leather football, which features on one side white stripes on each end, white laces, and black stamped lettering. 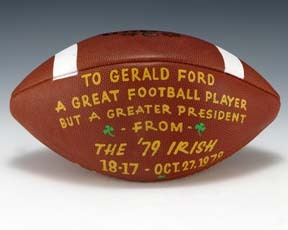 On the opposing side is a message from the Notre Dame football team to Gerald R. Ford painted in yellow. President Ford attended this game between Notre Dame and South Carolina on Oct 27, 1979 where Notre Dame defeated South Carolina 18-17.